Mushroom Mathematics is a new exhibition by Carsten Höller. The artist returns to Italy having presented The Florence Experiment at Palazzo Strozzi in Florence earlier this year. With a similar scientific approach, Carsten Höller premieres a series of sculptures and paintings that transform the gallery into a doubt machine. At first sight the viewer is confronted with a large vitrine that accommodates 48 replicas of mushrooms in various colours, sizes, and shapes each composed by one half Fly-agaric and the second half made up of edible, inedible, or poisonous mushrooms. The Fly-agaric mushroom (also known as Amanita muscaria) is an important element in cultural history: it holds poisonous and psychoactive properties and it is widely used in shamanic rites. This extraordinary mushroom has also become a symbol for the unexpected as it appears in fairy tales, early Walt Disney movies, and even in videogames such as Super Mario Bros. In the Victorian Age these mushrooms started to appear also on Christmas cards and therefore it is believed they even have affected the representation of Santa Claus (before Coca-Cola would turn this character into a red-and-white-dressed commercial machine). The sculpture Double Mushroom Vitrine (Forty-eight fold) is surrounded by a number of round and square paintings with the same size realized in different colours. 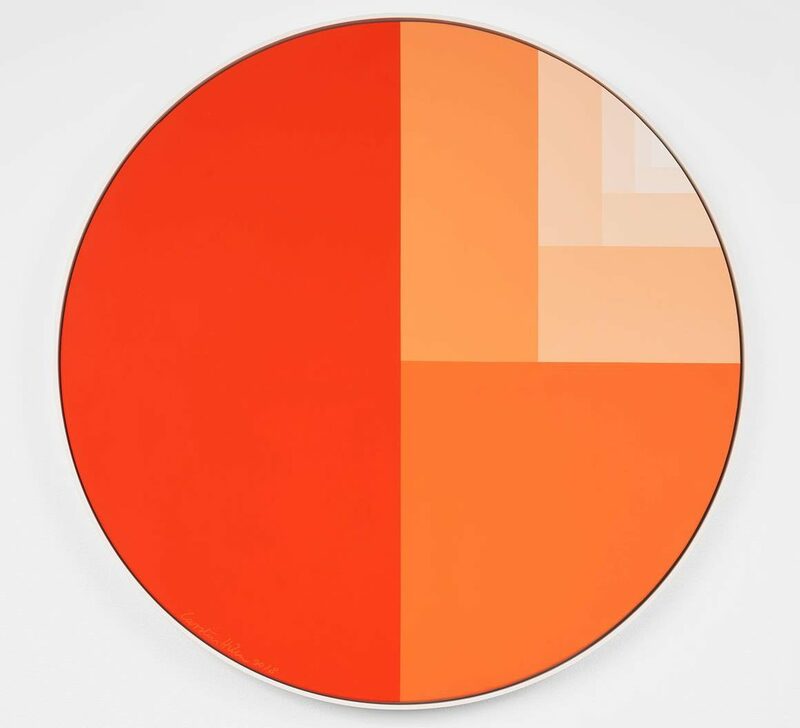 These Division Paintings are based on a simple mathematical partition principle: a line is painted on the canvas surface at the center, splitting it into two parts of the exact same size. One section is subsequently divided again into two new halves, and following this geometric pattern, the canvas is divided over and over again. These paintings, with their clean and accessible appearance, exemplify a simple path to achieve infinity, the most complex of the concepts. 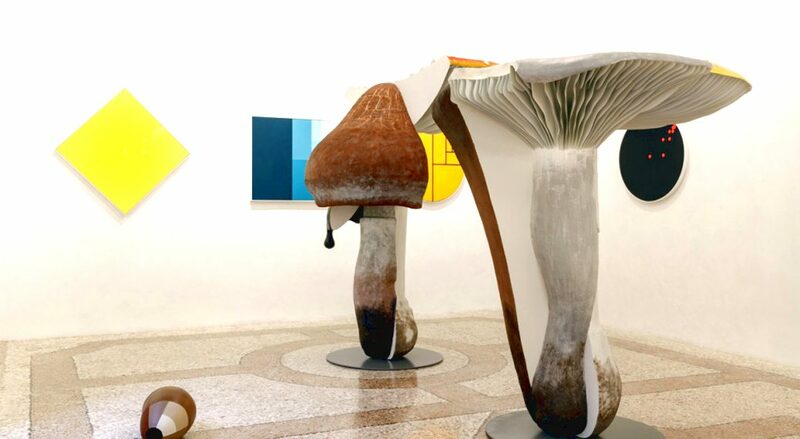 The same division lines return also in the main room of the gallery, populated by a series of Giant Triple Mushrooms that pop-up from the historical floor of Palazzo Belgioioso. These spectacular sculptures are composed of one-half Fly-agaric and two-quarters of other mushrooms. These mysterious vegetal elements (scientists still have many unanswered questions about them) are for Carsten Höller, the icon of uncertainty, ambiguity, as well as a symbol for an endless tension towards research: mushrooms not only open our mind to unpredictable effects, but they do so by living and reproducing in mostly incomprehensible ways. Inhabited by giant and life-size mushrooms and abstract linear paintings, Mushrooms Mathematics is a combination of geometry and magic, code and invention, rationality and the absurd, and invites everyone to explore new methods of understanding. Images: Massimo De Carlo, Milan-Belgioioso, 2018. Photo by Roberto Marossi. Courtesy Massimo De Carlo, Milan/London/Hong Kong.